The first customer in Europe has taken delivery of his new second-generation Nissan Leaf, just weeks after placing his order. 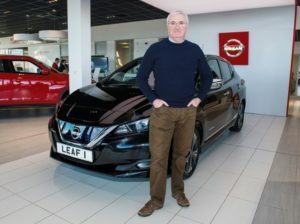 Leo Moran, 63, from Hartlepool, collected the keys to his special edition black Nissan Leaf 2.ZERO last week at Bristol Street Motors Darlington. The retired police officer converted to electric motoring a year ago when he purchased a 30kWh Leaf. As soon as the new edition of the British-built all-electric hatchback was announced, he began investigating and ordered the launch edition just before the end of last year. On top of Nissan’s suite of standard Intelligent Mobility technologies, including Intelligent Cruise Control, Intelligent Lane Intervention and Intelligent Auto Headlights with full LED, the all-new Nissan LEAF is also available with the e-Pedal, as well as ProPILOT and ProPILOT Park. The e-Pedal allows motorists to start, accelerate and stop using just one pedal, making every journey simpler and more enjoyable. ProPILOT advanced driver assistance technologies help the driver to steer, accelerate and brake on single-lane highways, while ProPILOT Park assists in similar ways with parking.